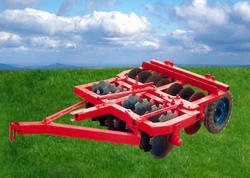 Offered by us is a wide and exclusive range of Disc Harrow. These products are demanded extensively in various industries and are appreciated for their rugged construction and durable standards. This range comprises of Hydraulic Mounted Disc Harrow, Mounted Disc Harrows and Offset Discs Harrow. We obtain these products from authentic vendors of the industry and make the entire range available to the customers in varied specifications, in order to meet the exact requirements of the clients effectively. 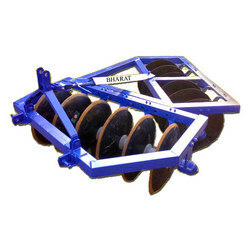 Established in the year 1960, we are considered amongst the pioneer manufacturers and exporters of Mounted Discs Harrow. As per industrial standards, these discs harrows are engineered by our expert engineers employing sophisticated techniques. 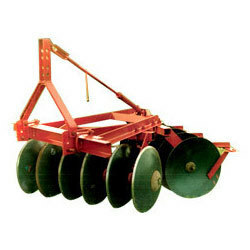 Broadly used in agriculture industries, these disc harrows are ideal for using in cultivation of land. Prior to dispatch, Mounted Discs Harrow is rigorously checked by our experts on different parameters prior to their final dispatch to the customers. This is a mounted, Disc harrow with EN-42 High CArbon STeel designed for working in orchards, groves and vine yeards, in addition to regular field discing. Its rigid constructions nd depth of penetration adapts it to heavy discing in tough soils, whilst unit attachment to the tractor; with , ensures easy discing in small areas and corners. The front and rear gangs can be positioned independently to obtain a required amount of offset to suit condition. This harrow will give outstanding results in field tillage and its sharp and strong Discs will invert soils and turn out stables, shrubs and will loosen and aerate soil to desired depths. It operates very effectively and efficiently, if properly adjusted and carefully handled. We are one of the leading organization engaged in supplying a qualitative range of Offset Discs Harrows. Ideal choice for heavy tilling, these harrows are suitable for all kinds of soil, especially clayey and loomy soils. Fabricated utilizing optimum grade material, these products are offered in different kinds of specifications to meet the variegated requirements of clients. Available in 12,14,16, 18 & 20 Discs as per availability of tractor H.P.
" We can modify all the implements according to any specific requirements of the buyer. 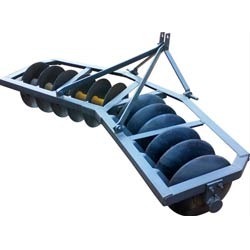 Backed by a team of dexterous professionals, we are reckoned amongst the topmost manufacturers and suppliers of quality tested Agricultural Disc Harrows. 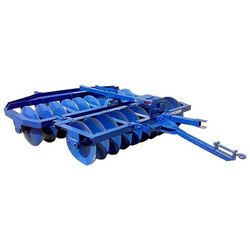 The offered harrows are mainly used for cultivation in agricultural fields. The provided harrows are manufactured under the stern guidance of our adept professionals using quality tested components and pioneering techniques. In addition to this, clients can avail these Agricultural Disc Harrows from us in various specifications and at marginal prices. This is a mounted, hydraulically operated Disc harrow with EN-42 High CArbon STeel designed for working in orchards, groves and vine yeards, in addition to regular field discing. Its rigid constructions nd depth of penetration adapts it to heavy discing in tough soils, whilst unit attachment to the tractor; with working depth controlled hydraulically, ensures easy discing in small areas and corners. This Harrow is available in 12 Discs,14 Discs & 16 Discs. Dedicated to carry various business operations in a best possible way, we are engaged in manufacturing and exporting Paddy Harrow. The offered range of harrows is manufactured at our well-equipped manufacturing base employing modern machines & equipments. Ideal for pudding in wet fields very smoothly, quickly and efficiently, these harrows are broadly used for rice plantation and sowing purposes. 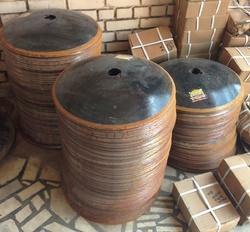 Due to our supreme quality of Paddy Harrow, we have made huge client base in the market. 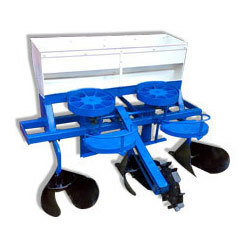 We offer various types of agricultural machinery like potato planter these implements are perfect for both big or small farm. The sow depth of seeding element is controled by the wheel which is of adjustable type. Backed by rich industry experience, we are able to offer a vast variety of agricultural implements Potato Planter. Designed & developed under expert vigilance utilizing sophisticated machinery and scientific techniques, this range of planters are widely demanded by our clients across the market. To ensure utmost satisfaction of our customers, we use high quality packaging material to deliver these planters at the clients' premises. Looking for Disc Harrow ?